Just starting out on scrapbooking? Learn how scraplifting can speed up your learning curve when you scraplift others’ ideas. It basically means copying others’ completed layouts in whole or in part. 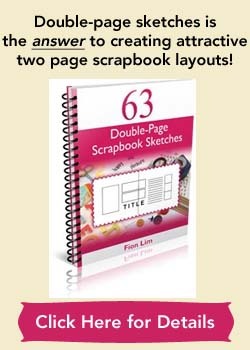 You might look at layouts in books, on the websites or at your friends’ scrapbooks, and decide to copy the whole “look” of it, part of the design, element or aspect of another layout for your own pages. And you know what? It’s perfectly alright to scraplift for your own personal use, for your family and for your friends to enjoy in your scrapbook albums. 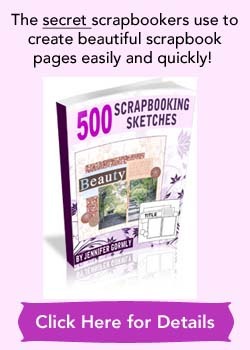 That’s how beginners or advanced scrapbookers learn. By adopting design elements and ideas that you like and incorporating them into your own creations. Usually, the original scrapbookers would be flattered to know that their layouts are wonderful enough for others to copy. Please understand that I’m talking about scraplifting for own personal use here. I’m not referring to copying and submitting layouts to magazines for publication or contest purposes. Sometimes, you’re in a creative block and it’s a great time to scraplift to lift you out of your block. These are times where you just want to follow along and scraplift another scrapbooker’s whole layout, that’s fine. Because it’s very likely that while the overall look is similar, ultimately you’ll be using different photos, colored cardstocks, patterned papers and supplies so you’ll be creating something that has its own flavor. It’s never going to be a 100% replica, but something very close or loosely based on the original layout. Other times, you might just want to scraplift part of the design. 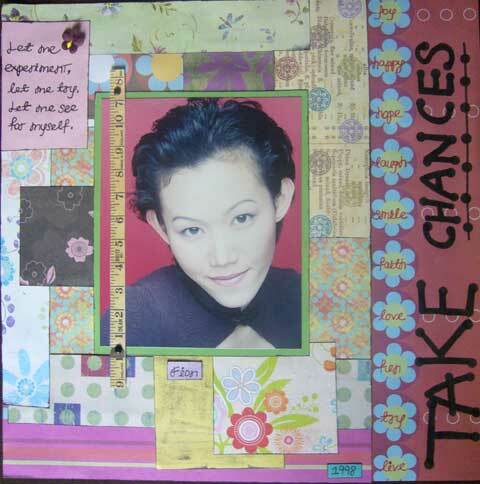 Then more often than not, the results you get will be very different from the other scrapbooker’s layout you’ve scraplifted from. There’ll even be times when you might create variations on the scraplifted layouts to fit your page theme. It’s like mix and match using others’ and your own ideas. In such cases, something quite unique could be born out of it. I scraplifted big time when I was a beginner, but usually there’s some slight variations. Scraplifting let me try out various ideas by looking and copying others’ pages for ideas. And I must say that the results are almost always pleasing to me. But I must also point out that the more I scraplifted, the more I learned and the better I scrapbooked over time. I think it’s probably because I’ve been attempting various styles and ideas, and my memory bank has been collecting many good design tips. So yes, over time I’ve learned to create some satisfying layouts on my own. Today I might still scraplift sometimes but I prefer to use scrapbook using sketches as it’s more time-saving than searching for layouts to scraplift, and I can spend more time playing around with choosing my photos, paper and embellishments while the placements of these elements are already laid out for me. Below are three layouts that I’ve scraplifted from different scrapbook magazines when I first started scrapping. When I did these layouts years ago as a beginner, I didn’t keep records of the exact borrowed issue and page of the layouts that I’ve scraplifted from. If you can recognize them, please let me know as I’d love to give proper credits to the original scrapbookers. So you see, as a beginner scrapbooker, you don’t have to struggle on your own to come up with original ideas. You can always learn by studying others’ layouts and scraplift those ideas that caught your eye! A great way to learn!